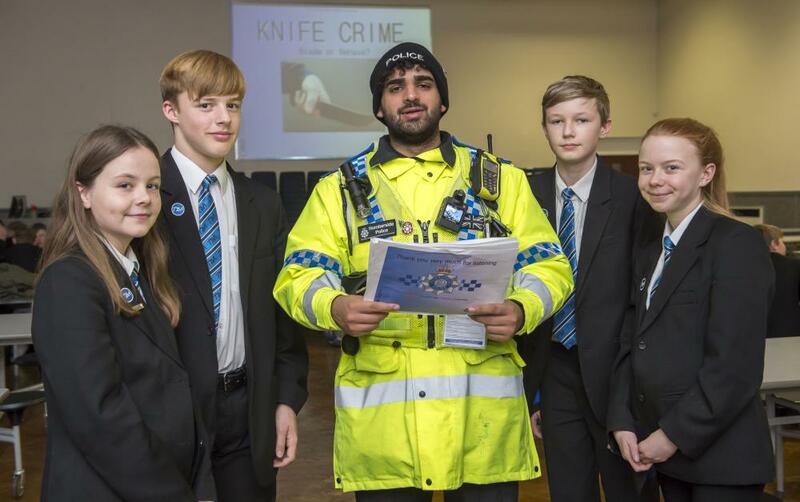 Pictured with PCSO Ali Mohammed are Tollbar Academy Year 9 students: (L-r) Violet Aisthorpe, Sam Farrow, Rhys Thomas and Liberty Bennington-Gardner. Year 9 students at Tollbar Academy responded positively to a talk by Humberside Police about knife crime. Set against a bleak background of rising knife crime in the UK, Cleethorpes PCSO Ali Mohammed said: "The message is a simple but very serious one. Knives ruin lives and there are serious consequences if caught with one." Student Rhys Thomas said: "The message is not to carry knives, and to tell a responsible adult if we know someone has a knife."